Stay updated on Visual Interest news and happenings, sign up for our newsletter! Tis the season! Visual Interest gives back! Help Visual Interest give back! 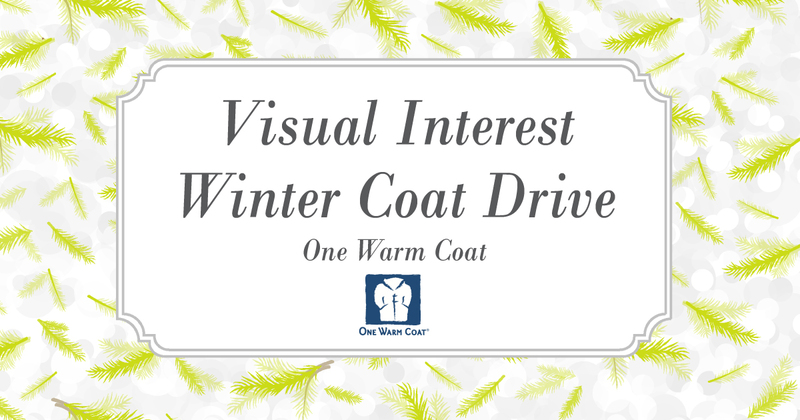 From now until December 8th, Visual Interest will be hosting a winter coat drive through One Warm Coat. We invite you to participate in our drive to help provide warm coats to those in need. You are welcome to drop your donations off at our office, OR notify your sales rep and we will pick them up from you. Looking for another way to give back? Your next chance begins December 11th! If you are interested in supporting children and families in need, please drop off your donations to Visual Interest OR notify your sales rep and we will pick them up from you! Follow our holiday drives on the social media channels below, and thank you for helping us give back!